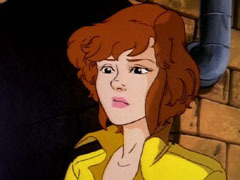 April O’Neil started out as an assistant for Baxter Stockman. When she discovered that Baxter was using his Mousers to burrow into bank vaults and steal from them, she attempted to flee Baxter’s workshop and found herself in the sewers running for her life, with several Mousers in pursuit. Three of the Turtles happened to come across her and save her and brought back to their lair, where she would meet Splinter and find out about their origin. With her new friends, she returned to Baxter’s hideout and defeated him. As the series went on, she became a closer friend to the Turtles and their link to the outside world. She also decided to reopen her father’s antique store ‘Second Time Around’. During the Shredder’s sudden return (What Goes Around… Comes Around!/Silent Partner/Return to New York story arcs) April, the Turtles and their new friend Casey Jones had to escape to Casey’s farm house in Northampton Massachusetts where she later had dreams about the Foot Clan’s attack. During these events she would know Casey better and in time take a liking to him. April would live with her sister Robyn O’Neil for a while during the events of City at War and find out their father died. Looking for a new place to live, she just happened to find the apartment Casey was living in. Eventually she’d marry Casey and they’d raise his adopted daughter Shadow Jones. In TMNT Volume 2 of the series, April would be attacked by Baxter Stockman, now a brain inside a killer robot (apparently, Baxter having escaped capture, had placed his brain in the body of a robot and sought them out in order to get revenge on April). She would be injected with something, and though the Turtles defeated Baxter, it was never revealed what exactly April was injected with. This would be somewhat revealed in TMNT Volume 4, as April and Casey wondered why they couldn’t have children and discovered deadly nanorobots within her system, threatening her life. With help of the Utroms, the Turtles made TMNT-style Nanobots that saved April’s life before Baxter’s nanobots could reach her brainstem. Time would pass and April still couldn’t have children. This put an emotional strain on April, and she became a female version of Nobody until she was discovered by Casey Jones. It was with the help of Renet taking her back in time that revealed that April was really a living drawing, brought to life with the help of Kirby’s crystal, drawn by her father, who at the time really wanted a daughter. This was before their own biological daughter Robyn O’Neil would be born. Unlike Kirby’s drawings drawn with pencil that would vanish after a while, April’s father used a pen, so it might explain why April lived past thirty without vanishing so far. Questions such as if she was real or not, whether she could live or die, or when she would eventually vanish were too much for her to handle. April bid farewell to Shadow and Casey and went to be alone with her thoughts in Alaska. Fan reaction was mixed, as many believed her normality served as a good contrast to the fantastic nature of the Turtles. No other incarnation of April has shared this origin to date. Unlike some of the other versions of her character, the Mirage Comics version of April has dark brown/black hair (though early color reprints of Volume 1 depicted her hair color as red/light brown). Most future incarnations of April that came afterwards are redheads. April, on the eve of a party to commemorate Casey’s promotion at a local supermarket, had Michaelangelo babysit Shadow. After going to sleep, the Foot kidnapped Shadow, giving her to her paternal grandfather, Antoine Puzorelli. Raphael made a deal with the Ruling Council of the New York Foot to get her back, one that called for him to personally assassinate Puzorelli, though it failed. Michaelangelo, after being confronted by a drunken Casey Jones, went on a solo mission and recovered Shadow from the cathedral she was being baptised at, returning her to April and Casey at the hospital after Casey had been shot (TMNT Vol. 3, #6 – 8). Antoine Puzorelli then had his thugs put his apartment on surveillance in an attempt to locate his granddaughter. When April caught on to this and told Casey, April, Casey, and Shadow went into hiding in the Turtles’ current hideout in the mausoleum of Westwood Cemetery. April was present when Casey accidentally clubbed Raphael when he returned to the hideout, thinking him an intruder. She, Casey, and Shadow met back up with Leonardo and Michaelangelo when they brought brought Donatello to their mausoleum hideout, where he was then revived (TMNT Vol. 3, #11, 12 & 15). April O’Neil (whose middle name was purported to be Harriet) was a television reporter for Channel 6 News. She was employed by Burne Thompson, though due to her headstrong nature and passion for her work, she expressed frequent disagreement with the assignments he gave her. She also butted heads on a regular basis with Vernon Fenwick, the director/camera operator whose enormous ego compelled him to beat April on her stories whenever possible. April was best friends with Irma Langinstein, the receptionist at Channel 6. April later could usually be found wearing a distinctive yellow jumpsuit with white boots. She lived in an apartment in New York City, though during the course of the series, she was forced to relocate several times due to a variety of indirectly Turtle-related mishaps. In the 1987 series, having been employed at Channel 6 for less than a year, April was reporting on a series of thefts of high-tech scientific equipment, apparently by a ninja (ostensibly components Shredder was securing for use in the Technodrome), when she came under attack by a gang of punks. Thinking quickly, she managed to squeeze into a storm drain and ran from the mob until she hit a dead end. As it happens, the Ninja Turtles were nearby and soundly defeated the punks for her. They took her back to their sewer lair for rest and recovery where they explained their origins to her. At first, she believed them to be responsible for the equipment thefts, but they agreed to provide her with the true culprits if she provided her assistance. April quickly became the Turtles’ link to the outside world, since their unusual appearance effectively precluded them from functioning above ground without some sort of disguise. April underwent multiple brief mutations over the course of the series. In The Cat Woman from Channel Six, an accident with Shredder’s Matter Transporter transmutated her with an alley cat. In Rebel Without a Fin, Dr. Polidorius, in a failed attempt to turn all humanity into aquatic hybrids, mutated her into a fish woman, giving her sonar powers. In Revenge of the Fly, Baxter shot April with a mutagen gun, which transformed her into a giant wasp. Each of these mutations was reversed by the episode’s conclusion. Playmates released a “Mutatin’ April” figure in the second wave of their “Mutations” line, homaging The Cat Woman from Channel Six transformation. Later in the “Red Sky” seasons of the series, Shredder succeeded in destroying the Channel 6 building, forcing everyone to relocate. In the eighth season April continued to work for Channel 6, but by the ninth season rather than stay working for Channel 6, April became a freelance news reporter for reasons never specified. Now she was wearing a brown jacket with a green shirt and a darker yellow pair of pants. She continued to help the Turtles, even after the defeat of Shredder and his subsequent exile to Dimension X. During the final seasons, April began to distance herself from the Turtles, even once rigorously badgering them in the press when they were framed in State of S.H.O.C.K, though she apologized when the Turtles proved their innocence. Despite still loving the Turtles, she maintained this character change for the remainder of the series, calling on the Turtles if she was in need of rescue or in over her head, but admitting that she had left her once adventurous life behind her and was trying to put her life back on track. The reason for April’s decision to become less biased towards the Turtles and gradually becoming tired of experiencing their dangerous lifestyle was never really explained, but some fans have speculated that April made a career decision to follow the facts as they existed and maintain objectivity, enabling her to be seen as a credible reporter in the city after her reputation as a supporter of the Turtles became too well known. Another popular theory is that she had begun to reach her mid-thirties and began longing for motherhood. Her Aunt Agatha (“Aggie”), who appeared in the episodes (Case of the Case of the Hot Kimono and Sleuth on the Loose), is a detective. April was normally portrayed as a capable woman, but also filled the role of the typical plot device of damsel-in-distress. Her obsession with “getting a story” led to numerous instances of poor judgment which often resulted in her getting captured for the Turtles to save. April’s innate curiosity and determination placed her in danger on several occasions as well. Her most important contribution to the Turtles was her experience in doing research on the Channel 6 computers and alerting the Turtles to trouble and possible case leads. This April appeared in the Turtles Forever special which is the pre-Season 8 version. She is seen in the movie being attacked by Mutant Pizza, Mutant Bananas, leprechauns and bowling balls but she is saved by the 1988s TMNT and she also got to met the 2003 Turtles and was ready to record this on her camera. 2003 Donatello asked her whats with the yellow jump suit and also said do you work in a car wash in this dimension. After that she is seen being attacked by the Mutant Banana and its unknown what became of her after that but the 1988s Turtles probably freed her at some point at the end of Turtles Forever when they returned to their own dimension. April was voiced by Renae Jacobs. There was also a two-part OVA series in Japan, in which April was voiced by Emi Shinohara. In the 25th Anniversary crossover movie, Turtles Forever, she was voiced by Rebecca Soler. 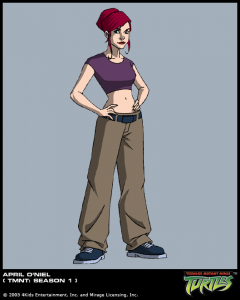 April also appeared in the Teenage Mutant Ninja Turtles Adventures comic produced by Archie Comics, which began as re-tellings of cartoon episodes but were eventually spun off into original stories. In this series, she began as a carbon copy of her animated counterpart, but the writers developed her into a competent warrior after training with Splinter. Years earlier in the September, 1985 re-printing of issue one, Mirage Studios artist Ryan Brown depicts April as a katana wielding ninja warrior in his back cover pin-up. Because of her frequent adventures with the Turtles, she lost her job at Channel 6 and became a freelance reporter. April received ninjitsu and katana training from Splinter, and gradually became highly profficient at fighting skills. Her remarkably quick progress was explained as being a result of her unique genetic lineage, having been a descendent of the malevolent sorceress, May East. Archie also published 2 sets of 3-part April O’Neil mini-series, the second of which dealt with the May East saga. In the Winter 1994 Archie Special, April was mutated into a turtle herself . This made April become the first official female turtle introduced to the series, three years before Venus de Milo’s debut. Just as in the Mirage comics, April started out as a science assitant to Dr. Baxter Stockman, the creator of the Mousers, but later helps the Turtles in their fight against The Shredder. Likewise, April owned an antique store which came under attack by The Shredder and the Foot Clan, who have come for the Turtles, and was destroyed in the ensuing battle. However, when she returned home from the Northampton farmhouse where she had been staying, she decided to re-open the store. o help the Turtles escape from the T.C.R.I. building, April stalls the military and buys the Turtles enough time to defeat the Shredder. Upon their escape, Leonardo jokes that April seems to have an aptitude for a career as a reporter; she responds with a sarcastic “Maybe in another lifetime”. April is also shown to have an attraction to Casey Jones, though their contrasting personalities often make them bicker. By the third season, the two are shown to be dating and appear to have developed a serious relationship. In the Fast Forward season it is revealed that the two eventually marry and have children. In the series’ actual plotline, the development between April and Casey is finally consumated in the episodes The Engagement Ring and Wedding Bells and Bytes. This version of April makes much more use of her scientific expertise, and she often uses her computer skills to aid the Turtles. This has also meant that she has developed a closer relationship to Donatello, who shares many of her interests. The two have even showed signs of a romantic attraction but have done little to capitalize on this. Truthfully, according to a bio book given to Toys ‘R’ Us, they share more of a brother/sister relationship, similar to that of twins. April also has developed modest combat skills after training with Splinter. She doesn’t play the helpless damsel-in-distress role as much as in the 1987 series, and her quick thinking is often a key to the Turtles’ survival. Indeed, in the second season episode April’s Artifact, the Turtles refer to her as ‘Jungle Girl’ when they are accidentally sucked into a jungle-like realm and she demonstrates the mentality and skills of a natural fighter and survivalist. She is voiced by Veronica Taylor. In the Fast Forward season, it is revealed that in the future, April, Don and Casey founded O’Neil Tech, and that she and Casey have children leading up to Cody Jones in the year 2105. April and Casey do not appear in this season in person, but many references are made to them, especially by her great-grandson Cody, and their voices are used as narration in the episode “The Journal”. In Back to the Sewer, April sometimes helps Donatello in collecting Master Splinter’s data bits. Casey eventually comes up with the courage to propose to April. When Casey places the ring he proposes to April with on her finger, it doesn’t take very long for her to fall to the Ring of Yin’s dark powers and evolve into a monster. However, all ends well when Casey removes the ring from April’s finger, and they, along with the Turtles, immediately talk about the wedding that comes along later. In Wedding Bells and Bytes April and Casey get married, though the ceremony is rendered somewhat too lively by a sneak attack by the Cyber Shredder and the Foot Clan, though the wedding entourage eventually prevails against them. April’s Maid of Honor is Michelangelo, who is a little too ecstatic about his role in the wedding. 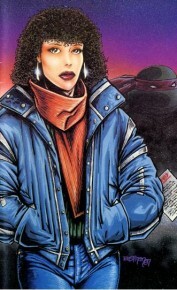 In the first TMNT motion picture, April (played by Judith Hoag) was a television reporter (though she worked for Channel 3 news in this case) working for Charles “Chuck” Pennington, and did a series of stories on mysterious thefts in New York City whose culprits vanished without a trace. One night when leaving work, she was accosted by teenage thieves in league with the Foot Clan, but the Turtles appeared and saved her by knocking out and tying up the teens under the cover of darkness. In the aftermath April discovered and grabbed Raphael’s lost sai, but Raphael soon followed her and took back the weapon and saved her again when she was attacked by a group of Foot Ninja in the subway and while trying to fight them off with her purse is knocked unconscious by one of them [with one punch]. Unsure what to do with her, he carried her unconscious form to their sewer lair. Though her fearful reaction upon seeing the Turtles and Splinter initially got the better of her, she eventually came to regard the Turtles as friends, and even allowed them to live in her apartment after the Foot Clan discovered and destroyed their sewer dwellings. Chuck fired April for a while. Also, Casey Jones develops a romantic interest in her but at first she didn’t feel the same for him. By the end of the film, she realizes she loves him and then kisses him. Mirroring the Mirage Comics storyline, the Foot once again attacked the Turtles in the antique shop, prompting April, the Turtles (including a wounded Raphael), and Casey Jones to retreat to her family’s farmhouse in Northampton, Massachusetts. She kept a journal documenting their forced sabbatical in addition to drawing sketches of the Turtles. During their respite, April also developed a kind of love-hate relationship with Casey Jones. She grew extremely close to the four brothers as well; Michaelangelo, who initially confessed to having a crush on April, later addressed her as “Sis,” indicating the role she had come to occupy in the Turtles’ family. In the second and third movies, April was played by Paige Turco. In TMNT III, April was temporarily transported to feudal Japan. April also made a live-action appearance in the TMNT: Coming Out of Their Shells musical tour, during which her role was to incite the live audience to interact with the stage performers and encourage the Turtles when needed. She was played by Sherie Rene Scott. April appears in the 2007 film voiced by Sarah Michelle Gellar; following the continuity from the previous films, it appears that she and Casey Jones are living and working together in a shipping firm, engaged in a relationship. It is she who finds Leonardo in Central America at the start of the film, having been in the area seeking an artifact for Max Winters. No mention is made of her past as a journalist, but it is instead implied that she has taken up archaeology as a career. She has taken up martial arts training from Splinter, purchasing a suit and armor from Japan and becoming skilled in the use of katana, apparently leaving behind her past as a ‘damsel in distress’. This is demonstrated as April and Karai fight it out while Casey, Splinter and the turtles battle the Foot in order to save Leonardo. This appears to be corroborated in a collectible booklet packed in with her action figure for the film, which implies that she has become a master of the katana. The figure itself includes a katana, tonfa, and two shoulder armor pads; this outfit would be replicated for the film. It is also noted that in the beginning of the film, she wears something similar to Lara Croft’s normal outfit. In this series April is now a 16 year old teenage girl. Splinter trains April as a Kuno-ich (female ninja). April is voiced by Mae Whitman. Nothing is known at this time.